Chesley Fence & Deck is the premier deck company serving Columbia, Illinois, and the surrounding areas. 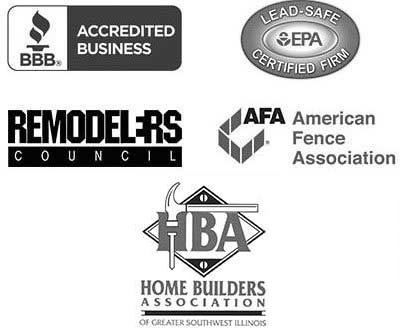 Having served area homeowners since 1967, we have earned a reputation for providing only premium products and installing them with the utmost precision. We also have an extensive list of satisfied customers, which is evidenced by our long-standing A+ rating with the Better Business Bureau. Treated lumber decking – This highly affordable decking option can be built to your specifications and painted or stained to your liking. Western Red Cedar decking – The top-quality cedar we use has superior resistance to warping and cracking and has a rich, warm appearance that will enhance any home. 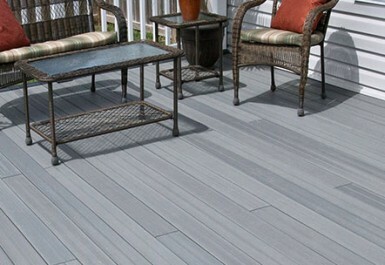 Composite decking – We offer several types of composite decking. However we usually recommend our Tamko EverGrain® Envision ® PVC coated composite because it is incredibly durable and beautiful and is backed by a 20-year warranty. In addition to offering a wide variety of premium decking materials, Chesley Fence & Deck’s service is superior to any other deck company in the area. We provide deck designs that are tailored to your specifications and have our highly trained and experienced technicians install them. To learn more about why you should choose Chesley Fence & Deck to be your deck company in Columbia, IL, contact us today.